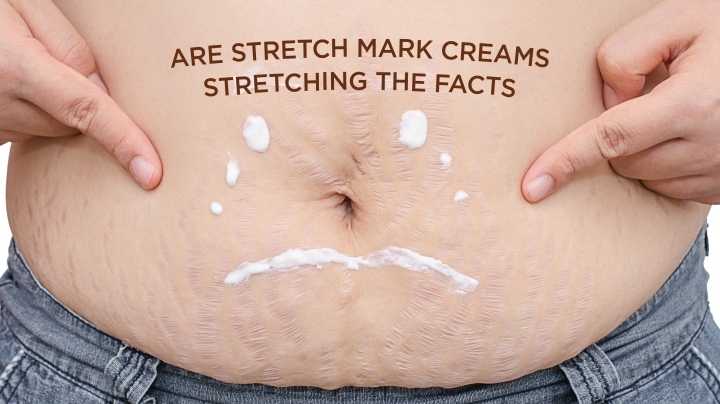 You Are Here: Home » Dr. Dhepe » Are Stretch Mark Creams Stretching The Facts? We hate to be the bearers of bad news but stretch mark creams might not be the miraculous skin-savers some of us thought they were. We all want beautiful skin, but somewhere deep down, we’re afraid to develop those unwanted scars. The concern is legit. Because stretch marks are a different kind of scars and they tend to stay permanently. And adding to the misery, they’re of three different types- striae rubra(red stretch marks), striaenigra(black stretch marks), striae alba(white stretch marks). Can Creams Really Help You in Clearing Stretch Marks? It takes commitment to apply stretch mark cream two to three times daily over the course of several months. So if it doesn’t really work, wouldn’t you like to know before buying one? Dr. Niteen Dhepe, Medical Director of Skin City, classifies stretch marks cream into good creams and bad creams. He says, “good creams usually contain moisturizers, containing vitamin E, silicon, hyaluronic acid, tretinoin, low dose hydroquinone etc. While bad creams contain a potent topical steroid, high dose of hydroquinone and unknown and unscientific ingredients. Potent topical steroid creams are known to cause new stretch marks and aggravate the existing ones. The Government of India has banned many creams containing topical steroids for over the counter sale. This is a welcome move to keep the bad creams out of the reach.” A good moisturizer, and a mild stretch marks cream containing retinoids, exercise, yoga, meditation and well balanced diet go a long way in not only treating the stretch marks but also in preventing it. When treating stretch marks, we’re effectively dealing with a scar which also has tearing of the top layers of the skin. It’s a very difficult thing to reverse it. This is something that patients can find very difficult to live with, and something that Dr. Dhepe believes is important to recognize. Stretch marks are clearly not dangerous; however, they are common and can be quite prominent. Many women feel that they are unsightly or disfiguring. But I think people now believe in effective medical treatments. Best Treatments for Stretch Marks? The best treatment of stretch marks is to prevent them. Various measures during weight loss, weight gain, exercise, pregnancy will minimize the chances of stretch marks. However the latest technologies available offer a ray of hope. Skin City has developed a unique combination protocol to treat stretch marks. It combines Ultrapulse laser, Cavitation ultrasound and RF skin tightening. One can expect amazing results if treatment with these great gadgets are combined. Six to eight sittings are required at 2 to 4 week interval. In short, there is a “cure” for stretch marks. However, prevention of stretch marks is not entirely in your power, especially during times of great hormonal fluctuations, such as pregnancy and puberty. If your mother has stretch marks, there’s a good chance that you will have them, too. We are medically led with all consultations conducted by a fully trained medical professional. Get started today to achieve a mark-free skin!